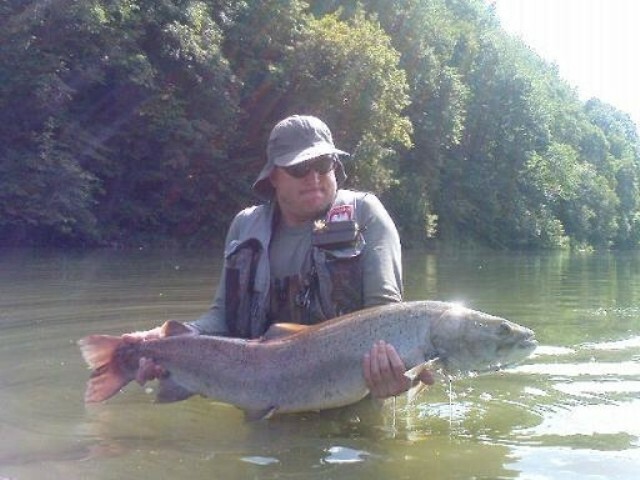 WELCOME to catch Hucho Hucho (Danube) at our best fishing grounds - the river Dunajec and Poprad. Our guides specialize in fishing for this species for many years. 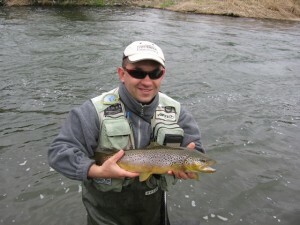 We invite you to journey with both spinning and fly fishing. Our guides will take you to the best places where you are sure there is a great chance to catch a large Hucho Hucho (Danube). Hucho hucho “has a slender body that is nearly round in cross-section. Its head is big, slightly flat with wide mouth reaching out of the end of the eye. The huchen’s fat fin is big while the remaining fins are relatively small. Its tail fin is clearly corrugated. Its hulls are very tiny. Its back is brownish or greenish grey, its sides are lighter with copper shine, the belly is white. On the sides, there are numerous, irregular, small, dark patches. 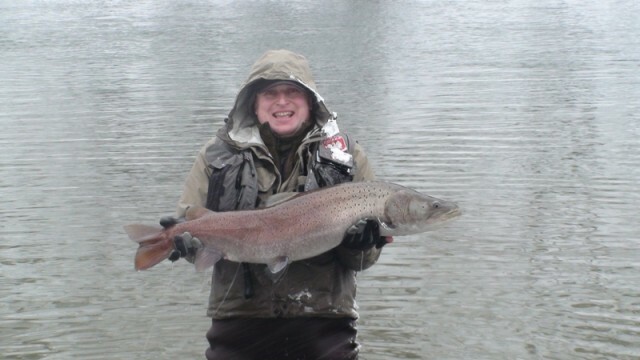 This largest permanent fresh water salmonid is on average 5-10 kg at a length of 80-100 cm. 15-year-long species may reach 150cm and weigh 52kg. The heaviest huchen ever caught was 60 kg at a length of 183 cm” – this is what Wikipedia will tell you. The rest are emotions, the dream of many spinning anglers. You may discuss the victories (more often defeats), baits, techniques, and even the most hidden fisheries for many days. Feel invited to come over two rivers where these copper monsters live. Both Poprad and Dunajec are shallow waters with up to 2m of depth. The pull force depends on the level of the river to a big extent. This means one thing: problems with the right choice of bait. With shallow waters, shallow but relatively lively baits are good. When the water raises by 0.5m only, you have to apply stream baits which are not so lively. Other baits? Of course but the number of torn sets will quickly make you come back to wobblers. 150 EUR per person - one person with guide. 100 EUR per person - two persons with guide. 130 EUR per person - one person with guide. 90 EUR per person - two persons with guide. In the case of a larger number of people, please contact us. The price includes: fishing with professional guide. My name is Łukasz Ostafin. I’m 33. I grow up and live at Raba river. Here I caught my very first fishes. My master was, much regretted Antoni Tondera. He showned me the secrets of “fly” method and “infected” with sport competition. I spend every moment , most of my life, with my rod fishing trouts and graylings. I love to discover new fisheries and observe the nature. I wore down many pars of wodders, when I was paddling in Raba, Dunajec or San Rivers. I’ve been angling all my life, mainly in the Danube as I live 200m from this river. I prefer spinning and fly fishing. 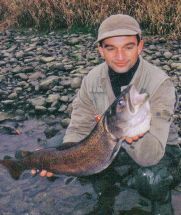 I’m mainly interested in salmonids but I don’t miss my chance to hunt for big zander or asp (I have Poland’s record in the longest asp caught). Besides regular fishing, I take part in spinning and fly fishing contests. I was the champion of Nowy Sacz region in spinning many times. I was awarded several times in prestigious events like Romaniszyn Cup or Lipien Popradu. Huchen is my passion I have been pursuing for over 20 years.